Beau's Barrel Room: Tasting Wine From Navarra, Spain. 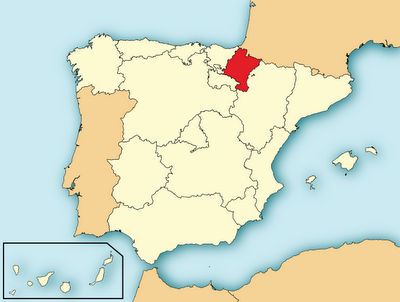 I recently tasted through ten wines from the Kingdom of Navarra, in Spain. This was another "Live Tasting" using the TasteLive website and hosted by Mike Wangbickler of Balzac and the Wines of Navarra trade group. Frequent readers (all five of you) may recall I've done a few tastings previously with Mike. I think they like me or something, and I ain't complaining! Over the past year I've been fortunate enough to taste a nice selection of wines from Navarra, encompassing reds, whites, and rosé's. This coming September I hope to visit Navarra as part of a blogger trip organized by the Wines of Navarra trade organization. There is a big push right now to introduce these wines to American palates, specifically through wine and food bloggers. While I may be a bit biased (being a wine blogger and all), I think this is a good idea. Out of the above list, I've actually had previous vintages of a couple of wines, notably the 2008 Ochoa Moscatel and 2009 Senorio de Sarria Vinedo no. 5. That Moscatel was sublime while the Senorio de Sarria did leave me wanting more. 1. 2010 Castillo de Monjardin Finca el Cerezo Chardonnay - Bright straw hued, a nose bursting with granny smith apples and pears, hints of tropical fruit and lemon zest. Off and on during the tasting, I smelled hints of coconut as well. The mouthfeel began as something soft and rich without being too heavy. There was ample pear and apple flavors held back by a nicely framed acid profile which kept the wine clean. I particularly liked the finish, almost Chablis-like in it's mineral driven finesse. Overall, at $12, a very nice bottle of wine. B, BUY recommendation. 13.5% abv. 2. 2010 Gran Feudo Rosado - Made from 100% Garnacha (grenache) grapes from a winery founded way back in 1647, the Gran Feudo rosado is electric pink with a hint of orange. I smelled ripe strawberries and a great mineral note. After letting the wine warm up a bit, I could detect some pleasant herbal aromas as well. When I tasted this rosado I was impressed with the way the acidity and minerality combined to create a bone dry wine with just a fleeting hit of ripe strawberries and raspberries. I think the group tasting was mixed in their reactions, some didn't like the strong acid and mineral profile, but I sure did. B, STRONG BUY recommendation. 13% abv. 3. 2010 Senorio de Sarria Vinedo no. 5 - Also made from 100% Garnacha (grenache) with an average age of 50 years, this was a stylistically different rosé than the Gran Feudo. The color is similar, vibrant pink with hints of orange. The differences were apparent right away, with the Senorio de Sarria smelling of wild roses, strawberries, and melon. A seam of orange zest wound its way through the aroma, adding a delightful facet. This was a heartier, richer smelling wine. If I had to draw one similarity with the Gran Feudo, the Vinedo no. 5 did have a bit of minerality present, but it was much riper and more fruit driven, balancing that ripeness with a touch of acid that kept this rosé in the "dry" category. At $16 it is a good deal and a quality wine. B-, BUY recommendation. 14% abv. 4. 2010 Senorio de UNX - Another grenache here, but a red one versus a rosé. Very red in my glass, this was perhaps the brightest wine of the tasting.For those of you who enjoy fruit-forward red wines, this will make you happy! The nose is all raspberry reduction and blackberry preserves over a hint of green herbs. The UNX makes no bones about it's ripeness, on the palate though there is some refreshing gravelly minerals and more of that green stem to restrain the big fruits. The finish got a bit hot for me, despite the wine being only 13.5% abv, but other than that it's a solid wine for only $8. B-, STRONG BUY recommendation. 5. 2006 Marco Real Crianza - A blend of 60% tempranillo and 40% cabernet sauvignon, this is some purple juice! My first whiffs brought back memories of cutting Christmas trees in a muddy field, the pine and wet earth mingling together. I also got some great herbal notes, black olives, and very dark fruit. Think blackberry and black cherry melded together in one of those industrial presses like they used to kill the first Terminator. The mouthfeel was thick, chewy and massive. I could taste the Marco Real all over my mouth. Loads of tannin, bittersweet chocolate, cassis, and leather all came to the wet-earth-sandbox. I liked this wine a lot but boy does it need some time in a decanter, or another five years in the bottle. B+, STRONG BUY recommendation, especially at $15 a bottle. 14.5% abv. 6. 2010 Ochoa Moscatel - The final wine of the evening, a delicious dessert wine. After tasting the 2008 Ochoa Moscatel, I had high hopes for this one. When I poured it into my glass I noted a gorgeous light honey color, almost romantic in it's lightness. Right away I could smell the aromas of peaches and pears in syrup, this got my mouth watering! I could also get a bit of apricots dancing their way through the peach and pear. Ochoa has been around since 1845, it's modern incarnation since 1985 when Javier Ochoa took it over. These days his daughter Adriana crafts the wines and is doing a marvelous job. I tasted more of the peaches and pears, mango, and enough acidity to prevent things from getting cloying and gross. I think the only knock was the finish which seemed to fall apart too quickly. That being said, the 2010 Ochoa Moscatel will only get better with a few more years in the bottle. It's $20 for a 375ml, about right for a dessert wine. B+, STRONG BUY recommendation. I had a great time (again) tasting through this lineup of wines from Navarra, as a wine geek chances like this are of immense value because they help me get to know that area's wines better. I think Navarra is definitely an up and coming wine region, the wines are fairly priced and well made with an eye towards drinkability. I'm not too sure if there are higher end bottlings from these producers but it would be interesting to taste them and compare to high end Napa cabernet, Bordeaux, and Rioja wines. Granted, that's a bit out of my pocketbook's range. Big thanks to Catherine Seda and Mike Wangbickler at Balzac Communications for putting this together. Catherine is the go-to for your Wines of Navarra questions, as well as being an all around great gal. Check out the Wines of Navarra links I've scattered through this blog to learn more as well as find some of these delicious wines. Nice notes! It's cool to see that they sent you such a good range of wines. I like that the two rose wines made your cut too. I was curious about them, and I think that Garnacha can make some really nice rose. I liked getting that range of wines, to see different styles and varietals as expressed by the Navarran winemakers. The rose's were quite good, and at those prices, really solid values. I'm hoping to get importer/distributor information at some point here, then I can update the blog. And bbq, big garden, great views, silence, nature... English spoken and good price!